BBC NEWS | Business | Northern Rock & Virgin: who wins? Northern Rock & Virgin: who wins? 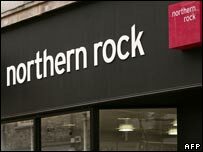 Northern Rock's future is looking anything but clear after a main shareholder threatened to block a takeover bid led by Virgin Group. Despite getting the backing of the Treasury, the bid may stall, and with bank currently propped up by £25bn of loans from the Bank of England - effectively taxpayers' money - there are a lot more interested parties than a typical business takeover. Here we take a closer look at what the likely deal means for Northern Rock, the Virgin consortium, Northern Rock shareholders, and the government and the Bank of England. We will also explore whether there will be any impact on Northern Rock's customers. Virgin's planned deal would incorporate the Northern Rock business into its existing Virgin Money brand. Northern Rock would maintain its stock market listing, but the name will disappear, being changed to Virgin Money. Virgin values Northern Rock at £200m, considerably less than its market value of £362m at the end of last week. It says it has no current intention of making job cuts from the 6,000-strong Northern Rock workforce, and also intends to continue operating the business from Newcastle-upon-Tyne. Northern Rock chairman Bryan Sanderson, has described Virgin's offer as "very good news" for the bank. Yet if Northern Rock's shareholders block the deal, the lender could be nationalised or be taken into administration. Alternatively, Virgin or another potential buyer could return with a more generous offer. However, most analysts expect the Virgin bid to be successful, largely because it has the backing of the government. The Virgin offer proposes an injection of £1.3bn of new cash into Northern Rock, with half of that money coming from the consortium. The remainder would be raised through an offer to existing Rock shareholders to buy new shares for 25 pence each. Virgin would end up with 55% of the new company, leaving current shareholders with 45%. The consortium has pledged an immediate repayment of £11bn of the £25bn Northern Rock owes the Bank of England, once its takeover is completed, with the remaining £14bn being paid over the next three years. BBC business editor Robert Peston has warned that if there was a severe housing market recession over the next two or three years, taxpayers may not get all of this remaining £14bn back. Yet our correspondent said Sir Richard Branson was putting more than £200m of his own money into Northern Rock, suggesting the Virgin boss was more than confident the bank could be successfully turned around. Mr Peston added that Virgin has also agreed it will only pay itself "normal" dividends from Northern Rock until all public money is repaid - thus avoiding the potential embarrassment for the Treasury of the group making spectacular profits with the help of the taxpayer-backed loan. Virgin's fellow consortium members are US buyout specialist WL Ross, UK investment group Toscafund, and Hong Kong-based investment firm First Eastern. The government and the Bank of England will likely breathe a mutual sigh of relief should the Virgin takeover be completed. They have both faced extensive criticism of their handling of the crisis at Northern Rock, but in fairness they were in a no-win situation. Accused by some critics of wrongly using £25bn to prop up a commercial bank that had got itself into difficulty, they would have faced much more criticism had they allowed Northern Rock to go to the wall, putting customers' savings at risk as a result. What is now key for the government is that the full £25bn of taxpayers money is repaid. While the Virgin consortium has promised to repay £11bn immediately, the remaining £14bn is to be repaid over the next three years. As we have already discussed, the danger is that the repayment of the £14bn could be affected by any future downturn in Northern Rock's business. The government could also still find itself in the position of having to nationalise Northern Rock should the Virgin bid fail and no other buyer come forward. While an unlikely outcome, such a move, with its echoes of 1970s Britain would send out a very bad signal over the health of the UK's financial sector. Northern Rock's shareholders - both large and small - have so far given Virgin's bid a lukewarm response. RAB Capital, which is the second-largest shareholder in Northern Rock with a stake of about 6.7%, said it would oppose the move from Virgin. Essentially waiting to see the full details when they are released in the coming weeks, big investors such as hedge funds RAB Capital and SRM Global have warned that they might vote against any Virgin takeover if they do not think it is generous enough. A group representing individuals with small holdings in the bank has also said it will need to see the details of the Virgin bid before they give their support. However, many investors appear very receptive to Virgin's plans, sending Northern Rock's shares up 48% to 127.4 pence in early Monday trading. Existing shareholders are being offered the chance to buy new shares for 25 pence each. The value of these - and the shares they already own - could soar if Virgin successfully turns around the business. If Virgin's deal is successful, the BBC understands that the government will continue to guarantee Northern Rock's savings deposits, both new and existing. Once the combined bank gets an investment grade rating from the rating agencies, the Treasury will withdraw this guarantee, giving three months notice of the move. But while money saved with Northern Rock will be safe, the bank's savers may find they are offered less attractive interest rates and mortgage holders without fixed rate deals may have to pay more. To understand why this will likely be the case, you have to return to why Northern Rock got itself into financial difficulty in the first place back in September. The bank was able to offer very competitive mortgage rates because of the unique way in which it borrowed its funds. Unlike most banks which fund their mortgage offerings through their savings deposits, Northern Rock's business model determined that it could secure the funds it needed more cheaply through the short-term wholesale money markets. But when the cost of that credit shot up, sparked by the downturn in the US mortgage sector, Northern Rock found it could no longer afford the money it needed. What deals Northern Rock will be able to offer customers under Virgin's ownership will depend upon both a recovery in global credit markets, and whether Virgin and its fellow consortium members are more canny in getting the funding the bank needs.